Now I can say that Microsoft is getting really desperate at promoting Internet Explorer 8. First there's the partnership with Feeding America on which they will donate 8 meals for every download of IE 8 HERE. Then there's this game that is available only for IE 8 users. The lucky winner will get to keep $10,000. Next up is Microsoft's own version of MythBusters, which most people think is questionable and somewhat crappy ridiculous. 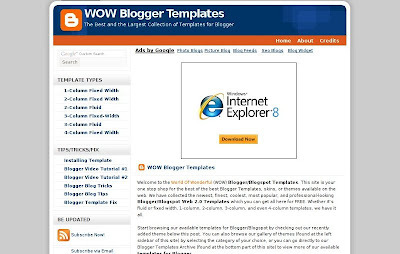 Yep, those are Windows Internet Explorer 8 banners that were seen on a couple of AdSense ad spots at my blogger templates site. That means Microsoft is buying Google AdWords to promote the latest version of their web browser. Microsoft and Google are supposed to be competitors in the advertising market, right? Not to mention the browser market. Those series of bizarre events made me wonder what's going to be Microsoft's next big move to boost the popularity of IE 8. Any guesses? Speaking of IE - your blog seems to break IE (it breaks the connection when the page is just about loaded completely). Is that intentional or an accident?